Joseph Cullen Root, a prolific founder, founded four fraternal organizations during his lifetime, one of them being the Modern Woodmen of America (MWA). MWA was founded on on January 5, 1883. Root was inspired by a Sunday sermon in Lyons, Iowa. During the sermon the pastor extolled the virtues that came from “woodmen” cutting down the forest to build homes and communities. It was then that Root adopted the term Woodmen for his newly formed organization. The tools to clear those forests were adopted as symbols for the organization at the same time– axe, beetle (mallet) and wedge – symbolizing industry, power and progress. After Root had a falling out with the Woodmen of America, he founded the Woodmen of the World organization on June 6, 1890, at Omaha, Nebraska. He had been a member of several organizations, including the Odd Fellows, but Root wanted this new organization to be beneficial. He wanted to make sure that after the death of the breadwinner that the family would be protected through a death benefit payout. In addition to the life insurance benefits, an early program that lasted until the late 1920s, was to provide a marker for each member upon their death. 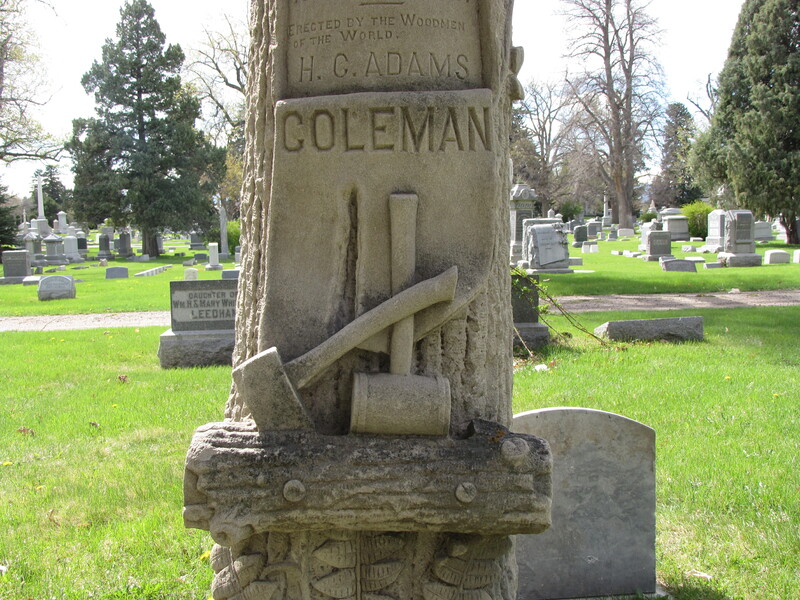 The influence of that early sermon can be seen in many of the tree-stump tombstones, fitting designs for the Woodmen of the World members, with its imagery the axe, beetle, and wedge. The tree-stump tombstone is also a physical depiction of the cleared forest. There are many varieties of what these gravestones look like. This entry was posted in Treestump gravestones. Bookmark the permalink. I am a native Hoosier, and I thought that tree stump graves were mostly to be found in Indiana, Ohio, and Kentucky. I was very surprised to see a tree stump grave on a recent trip to New Orleans. Are tree stumps most common in the Midwest? Also, do they most commonly belong to the Woodmen? Many of the sites that I have visited do not have any iconography of the Woodmen. Last, can you recommend any good books regarding tree stump graves? I am not sure there has been a study on where the most tree-stump tombstones exist. I have seen them in many states outside the Midwest, including Colorado and California. Susanne Ridlen has written a book titled, Tree-Stump Tombstones: A Field Guide to Rustic Funerary Art in Indiana but the book is very expensive even used it costs more than $100. 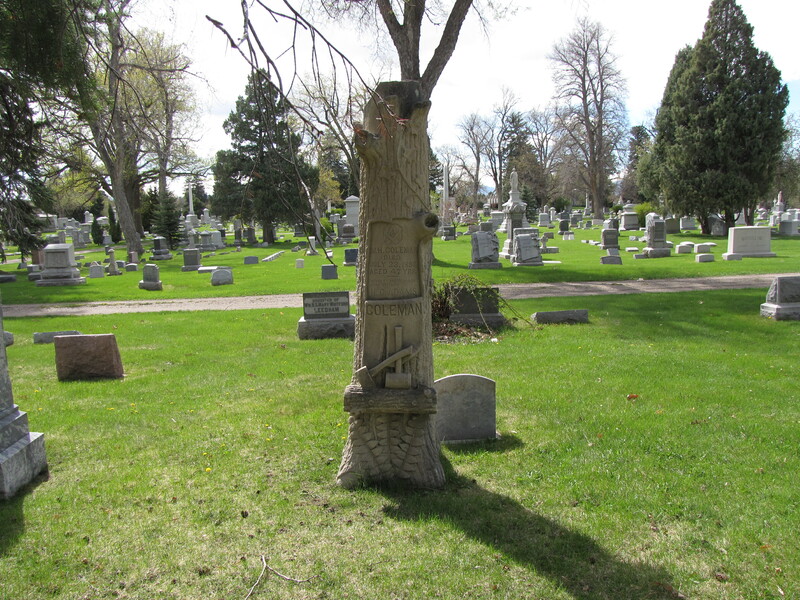 She also wrote a definitive article about Indiana tree-stump tombstones in the AGS (Association for Gravestone Studies) publication, Markers XIII title, “Tree-Stump Tombstones: Traditional Cultural Values and Rustic Funerary Art”. You can get a copy of Susanne Ridlin’s book by calling 765-457-3242. This number is for the Kokomo, IN library, but ask to transfer youto Old Richardville Publications in the same building. I just got a copy of her book Tree Stump Tombstones, for $15.00, which included shipping. Its a great book! Since last fall I’ve photographed over 250 tree stump tombstones from southern MN to TX, with about half being WOW markers. Very cool! If you are in the Indianapolis area, go to Crown Hill Cemetery where you can find the most ornate ones I have ever seen. The iconography is splendid. So far, I have only seen one (near the west-south end of the old part of the cemetery, near the Gothic Chapel) that has the WOW emblem. There are also a few that have Masonic emblems. There are several limb tombstones in graveyards in Illinois also. They are very common in Minnesota and Iowa. Many times they were ordered through Sears and Roebuck. I have mail-order catalogs from 1900 that showcase these grave markers. Dear Nikki, Would you possibly do me a favor and send me a scan of some of the gravestone pages from your Sears and Roebuck catalog? I would love to post the photograph with the add in the catalog.